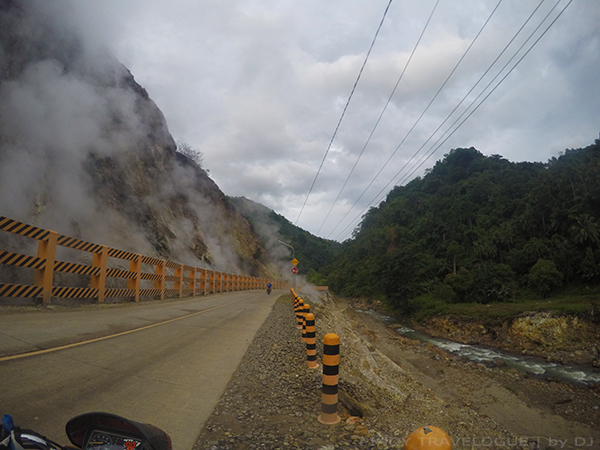 We've gone 30 minutes from Casaroro Falls when I perceived an unpleasant odor as if somebody released that mighty gas. Nobody farted. The undesirable smell apparently emanates from a hill that perpetually gives off a great deal of vapor. Clouds of sulfuric fumes steams toward the sky, fortunately not blanketing the paved road that cuts through the smokey hill as our habal-habal passed by. It was an instant attraction, worthy of a few snaps. 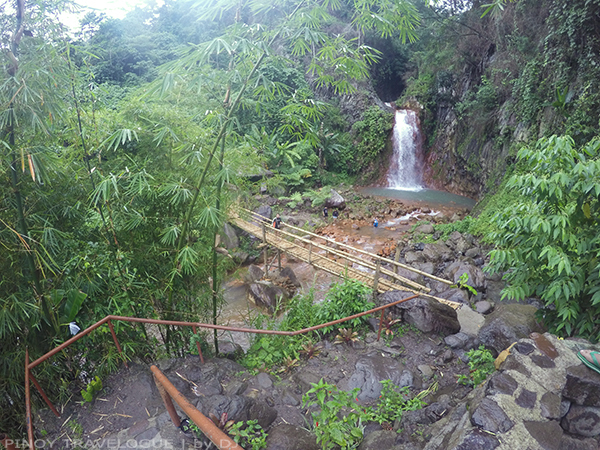 Past the smelly vicinity, road signs point to Pulangbato Falls and Red Rock Hot Spring. We drove uphill, following the instruction to turn right, along a series of alternating cemented and unpaved portions of the road until we arrived at the hot spring. 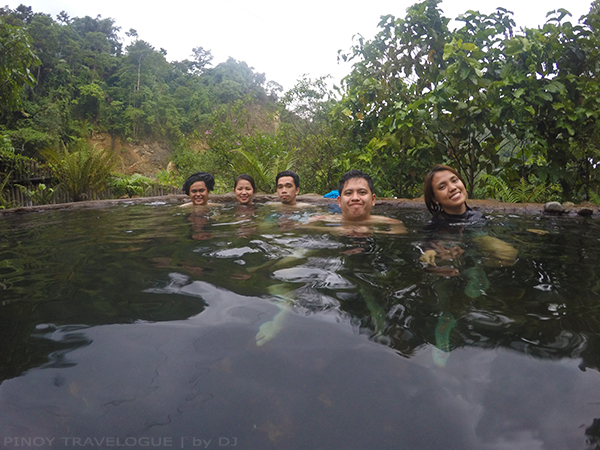 Fresh from a daring feat at Casaroro, the sweltering spring didn't seem ideal for our pumped-up limbs, thus moving on, heading to the waterfalls supposing it offers a stimulating dip. 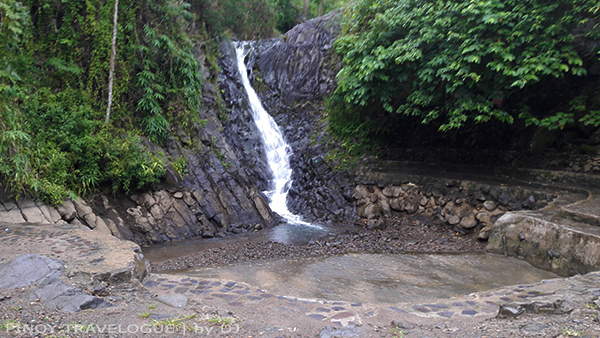 READ ALSO: Casaroro Falls of Valencia, Negros Oriental — "She's magical"
Baranggay Malabo's twin cascade demands no struggle unlike Casaroro. The twin nestles within a fenced facility surrounded with well-maintained resort amenities and lush greenery. I could hear the soothing sound of gushing waters upon entering the gate — her way of telling she's just around the corner, waiting for everyone to witness her unique elegance. Past some thatched cabana and a cemented swimming pool that doesn't seem inviting, the twin falls reveal themselves. The first cataract streams through a dark grayish limestone wall, down to a pebbly, riprapped basin that's generally brown in color. A mini dam controls the volume of its basin whose water torrents down near her twin waterfall when released. That moment, the dam was open; the basin has only a puddle to dive into. The other cascade nestles down the slope, exuding its unearthly beauty. 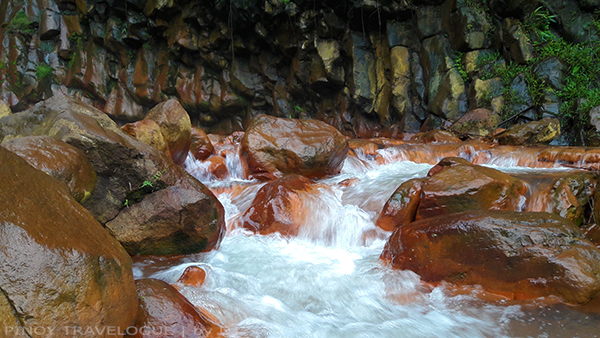 Its water flows down a moss-green swimming hole; a part of its wall, the edge of its semi-circular basin, and the rocks positioned at where the water streams through are in distinctive red and orange hue. 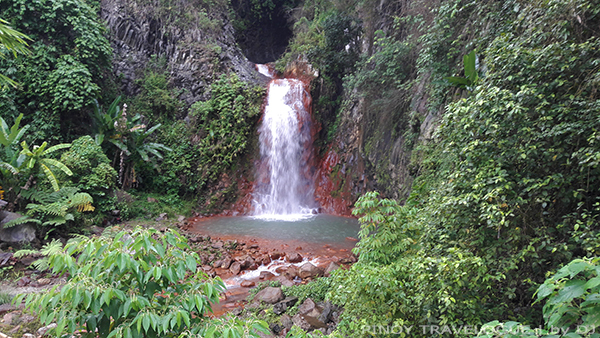 Pulang bato means "red rock" in Filipino, hence the waterfall's name. The water's sulfur content dyes rocks, turning them into orange-red. 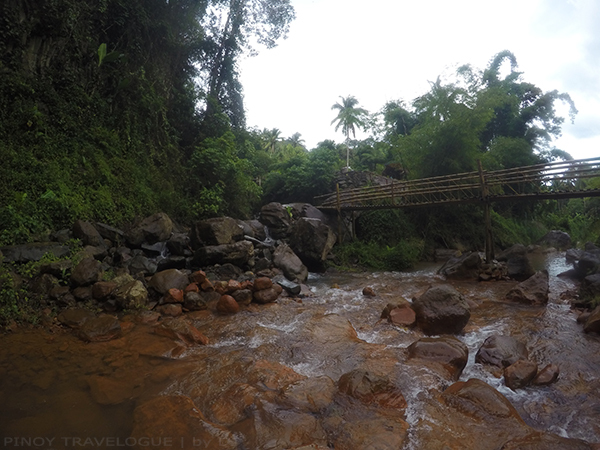 Cemented, hand-railed steps and a sturdy bamboo bridge brought us closer to the falls' otherworldly presence. The water is cold despite its Chemistry-ish feature — cool enough to soak and relax my legs. Her mist enchanted me to swoop in but the chill of a gloomy late afternoon prompted me to spare it for the warm spring dip. Smoke rising up from the folds of rocks indicates that the town of Valencia sits near an active volcano. When there is such, chances are, there will be places where warm water springs from the ground. Red Rock Hot Spring (RRHS) boasts itself as a relaxing sanctuary amidst the cool temperature of Valencia. According to a signage that welcomes the visitors upon entry, the water comes from a naturally occurring spring that spouts through an opening by the pool. The resort owner built a pool around the natural stream to accommodate more members of their family. When people started enjoying the waters of the pool, the family opened it officially for public use. We shed our clothes off. Slowly, we stuck our feet in the tolerably warm water until our bodies were totally submerged. For less than an hour, the above-thirty-seven-degree waters of Red Rock Hot Spring capped off our day of nature wallowing. Philippine Institute of Volcanology and Seismology (PHIVOLCS) classifies Mt. Talinis or Cuernos de Negros, located southwest of Valencia, as a potentially active volcano. Blame it for the fart-like fumes. 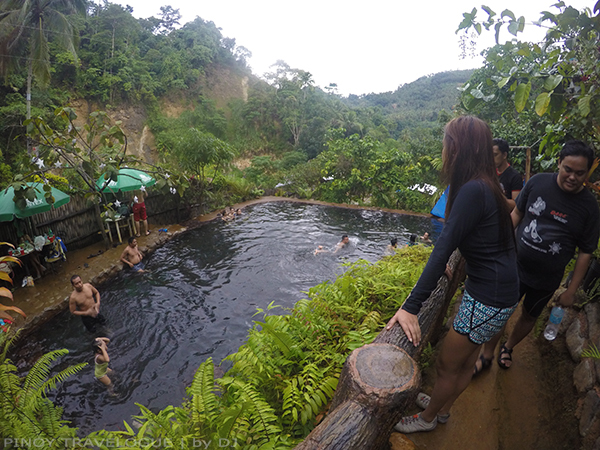 Because of the town's big source of geothermal energy, Valencia is home to a certain geothermal power station that generates electricity and supplies the needs of Negros, Panay, Guimaras and a portion of Cebu island. Ride a habal-habal (motorcycle) going to Pulangbato Falls. Fare: PHP 200, round trip; Travel time: 15-20 minutes; Expect to shed an extra amount to include Casaroro Falls on your trip. Yet another alternative (how we made it): Visit Balinsasayao Twin Lakes prior to Casaroro and charter the same habal-habal that would take you to the lakes (see below itinerary). Haggle skillfully but with a heart. Fare: PHP 800 per motorcycle, good for two persons; Destinations included: Casaroro Falls, Pulangbato Falls, Red Rock Hot Spring and back to your hotel in Dumaguete; Pros: Saves commuting time, gives enough moment enjoying the marvels of Valencia; added comfort since they would bring you back to your hotel; chance to befriend your local drivers. Our friends behind the wheel. 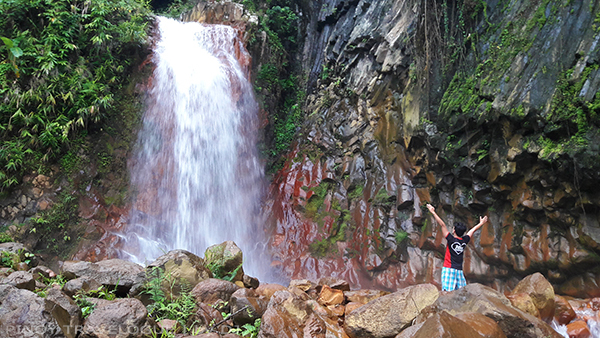 Pulangbato's cold waters may stain your clothes. Wear clothes of dark shades. 8:00 AM : Breakfast at Dumaguete Market — those budbod and puto maya are a must-try! 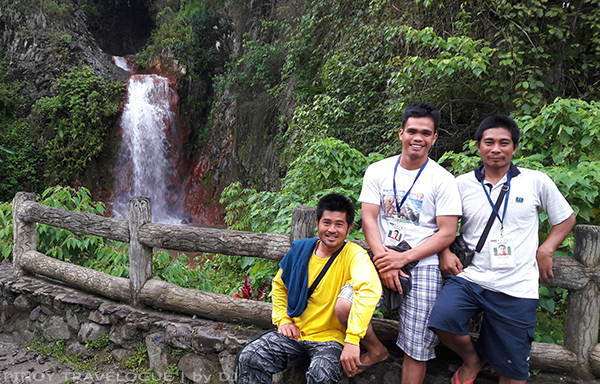 Casaroro Falls of Valencia, Negros Oriental — "She's magical"
how much is the estimated bdget from cebu to pulangbato? Have no idea how much is from Cebu.